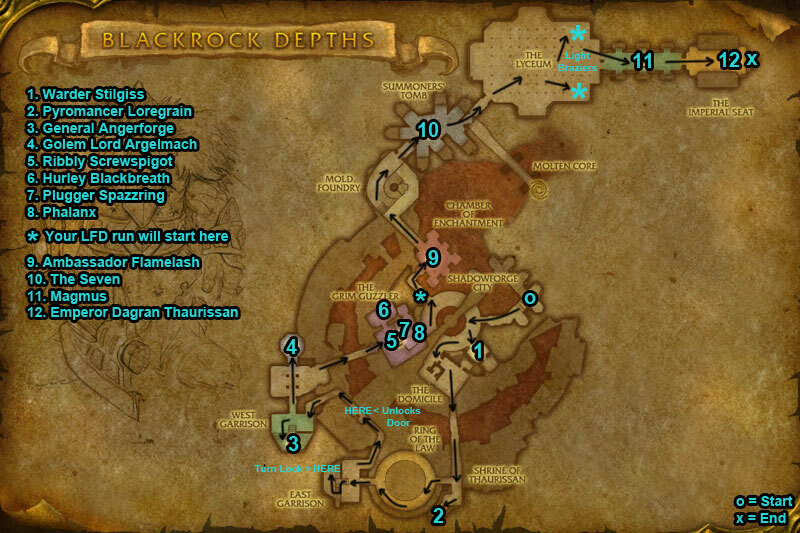 You can find the Blackrock Depths dungeon entrance within Blackrock Mountain, Eastern Kingdoms. 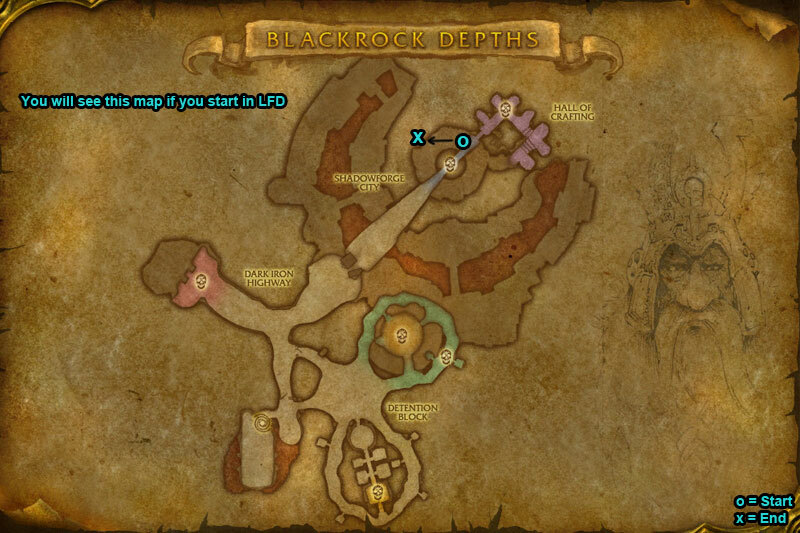 Make your way over to the Blackrock Depths summoning stone (located in the middle), you can reach hear by flying over or climbing down the chain. Head down long chain & you should see an npc Lothos Riftwaker, run past him &inside take left side, run all the way through & at the back you will come across the entrance. 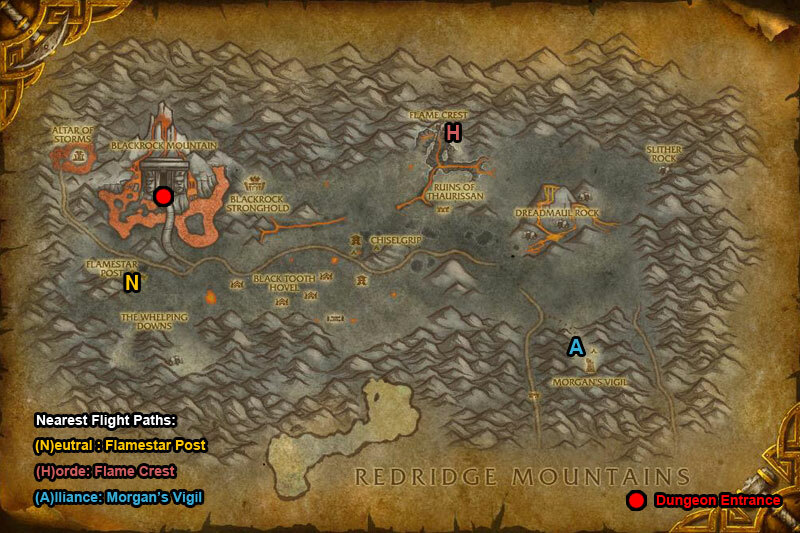 The door to reach West Garrison will be locked (shown on map). To unlock the door you will need to pull The Shadowforge Lock. This is located within East Garrison down the stairs. To unlock the door to the bosses (11 & 12) light the two Shadowforge Braziers (shown on map as blue stars). To light them you need to get a Shadowforge Torch, kill two Shadowforge Flame Keepers walking around to loot. 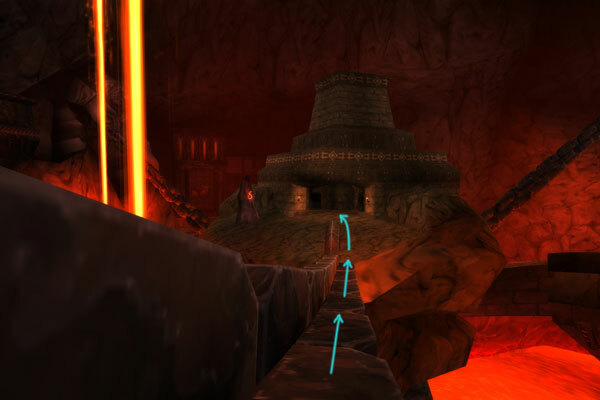 If you enter this dungeon through LFD you will start next to an Abandoned Mole Machine, the bosses players kill are from 9 – 12. /i Kill the dog first. Uses frost spells. Interrupt ‘Frostbolt’. /i Kill fire totem. Flame Shock inflicts fire damage to a player. Interrupt Molten Blast. /i Sunder Armor increases physical damage taken. Uses Enrage. At 40% health summons mobs to fight (interrupt Medics healing spells). /i Uses Chain Lightning. Players are hit with nature damage. /i (he is friendly, speak with him to start fight). Deals physical damage. Hamstring damages & slows movement speed. At 30% health boss runs away from players. /i (smash the 3 Thunderbrew Lager Kegs in the empty left room to summon boss). Avoid frontal fire cone Flame Breath. Drunken Rage increases his attack speed & physical damage by 50%. /i Turns unfriendly when you kill Plugger Spazzring. Mighty Blow damages & knocks back player. Thunderclap damages all nearby & slows speed. Fireball Volley inflicts fire damage to all nearby players. /i Burning Spirit sacrifice themselves when near boss to increase his damage & size, this stacks. Inflicts fire damage to players hit by his melee. /i Speak with Doom’rel to start. Kill all 6 ghosts & boss will join fight. Summons Voidwalkers. Interrupt Banish & Shadow Bolt Volley. Immolate inflicts fire damage to a player. /i Careful of statues flames. War Stomp inflicts physical damage to all nearby & knocks back (if you are hit with this you will be stunned). Fiery Burst inflicts fire damage to players in selected areas. /i Hand of Thaurissan inflicts fire damage to a player & stuns them. Interrupt High Priestess of Thaurissan (you can interrupt all her spells).